Legendary as the world’s most dangerous road until a paved alternative was completed in 2006, “El Camino de la Muerte” attracts thousands of thrill seeking mountain bikers annually. Starting outside the Bolivian capital of La Paz at La Cumbre Pass and a lofty 4650 meters (15250 feet) elevation, this now widened and relatively safer mostly dirt road drops almost 3500 meters (11500 feet), from the Andes to the Yungas rainforest far below, in 63 hair raising kilometers. In the past, countless lives were lost every year when vehicles (particularly busses) went careening over the edges of the 3,000-foot cliffs that line the road. Sadly some 25 cyclists have met the same fate. For the fainter of heart and saner of mind, Gravity Bolivia offers professionally guided daily descents, and advises that the road is best not tackled during the mid-December to early March rainy season when downpours, fog, washouts and other pitfalls are encountered. This ominous moniker has been given to the gravel road that connects the departments of Putumayo and Narino. 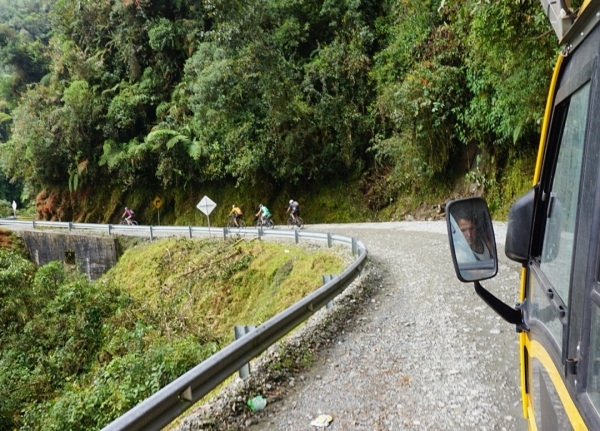 On a brighter note intrepid cyclists also consider it to be one of Colombia’s most beautiful routes. Predictably the journey is both dangerous and breathtaking, due to the steep climbs and frequent landslides, as the road winds rapidly upwards through jungle to cloud forest, past mist-shrouded waterfalls, and ultimately onto the páramo. 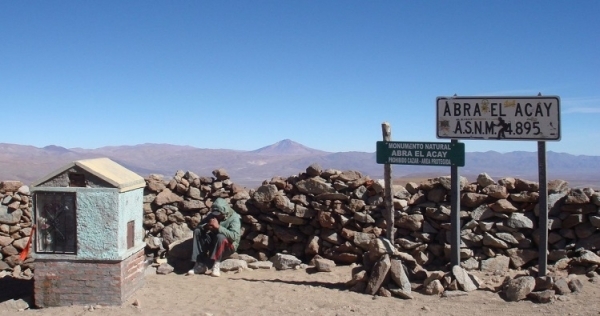 The largest border crossing between Argentina and Chile is located a mere 20 km from the summit of Aconcagua, the tallest peak in the Andes range at 6960 meters (22830 feet). Starting on the Argentinian side in the village of Uspallata you’ll gradually ascend 1200 meters on tarmac to the frontier at Las Cuevas, where most cycle tourists spend the night, before cruising down the Chilean side on a spectacular 2350 meter descent with 29 switchbacks into the town of Los Andes. 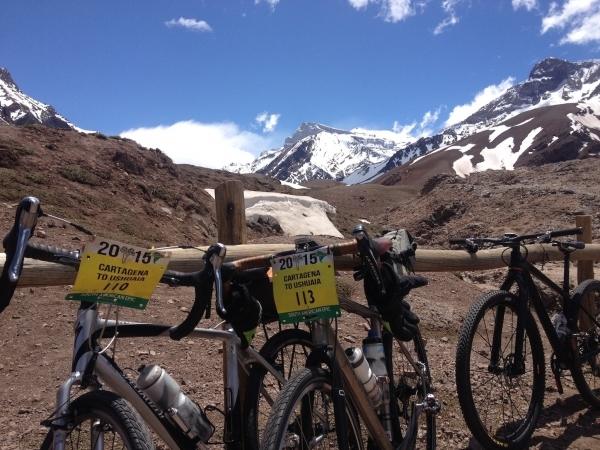 Try to pick a day when clear skies are forecast so you can catch a glimpse of almighty Aconcagua at km 72. The drawbacks are this is a busy highway with several tunnels and unpredictable winds and weather, so warm reflective clothing and lights are a must, plus you’ll have to catch a ride through the Tunnel Cristo Redentor at the border which cyclists are not permitted to use. Volcano Alley refers to a 300 km/180 mile stretch of the Ecuadorian Andes near the capital city of Quito that includes all of the country’s highest mountains. 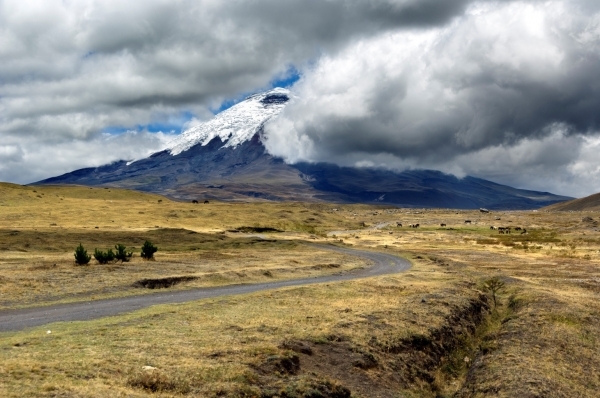 Riding the 90 kms southbound from Quito to Latacunga will take you past Cotopaxi, the most infamous in this chain of active and foreboding volcanoes. While this portion only involves 1750 meters of climbing and descent, you’ll be challenged by the altitude of 2500-3500 meters and wowed by the vistas, presuming Illapa, the Inca god of weather, is with you. 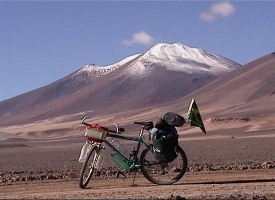 In 2000-01 Brasilian Antonio Olinto Ferreira undertook a 3000 km 2 month trek, the 7 Passos Andinos, tackling some of the gnarliest and remote mountain passes in and between northern Chile and Argentina. These included the Abra el Acay, in La Poma department, Salta Province, which, at 4895 meters, is the highest pass on Argentina’s fabled Ruta 40, and the highest navigable by vehicle pass in South America. You can watch his spirit-filled documentary capturing the mind boggling scenery he traversed, the cultures he encountered, and the hardships he overcame, here. Not all cycle tourists relish massive climbs or riding at high altitude. With them in mind we include the southbound descent into or northbound climb out of the hamlet of Villa Cerro Castillo. 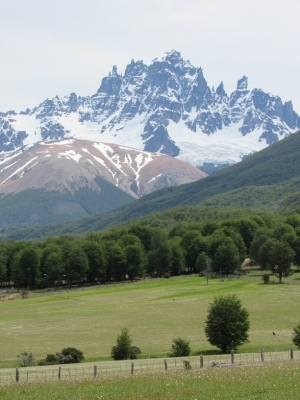 Located 100 km south of the small city of Coyhaique and close to the midway point of the iconic Carretera Austral, you’ll be awed by the views of castle shaped Cerro Castillo mountain, as you zoom down or grind up 440 meters of elevation change over a 6 km stretch. Brian Hoeniger works for TDA Global Cycling. You will find some of these climbs and descents on our South American Epic, the only organized cycling expedition to traverse the continent from top to bottom. 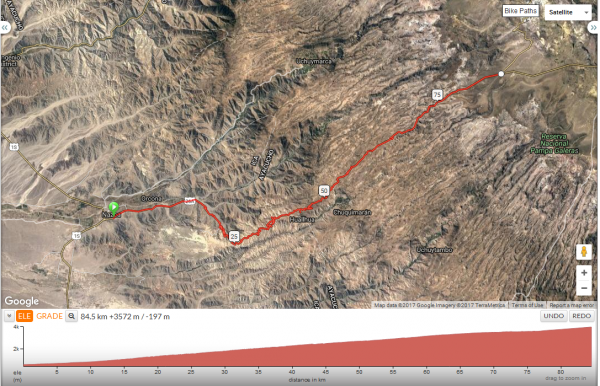 2 comments for "Cycling South America: 8 Epic Climbs and Descents"
Thanks! Great blog i seen ever. I love cycling and this is very informative blog..
Last October went on this so called “death road”. My opinion: it is far from being a death road. It used to be for truck and bus drivers, but for cyclists… no way. But it is good tourists atraction for less experienced mtb cyclists to say, what they did. I have seen 10 yrs old kids with their moms obviously without much mtb experiences. And the guide, that took our group to “death road” started his presentation explaining us (a group on a 11.000 km long trip), where on the bike is front brake, where is rear brake and so on. Ok, views are sometimes stunning, but upper part, which should be the most atractive, is usually foggy (according to one of the guides). So, as I said, a good tourist trap, but no thrill. 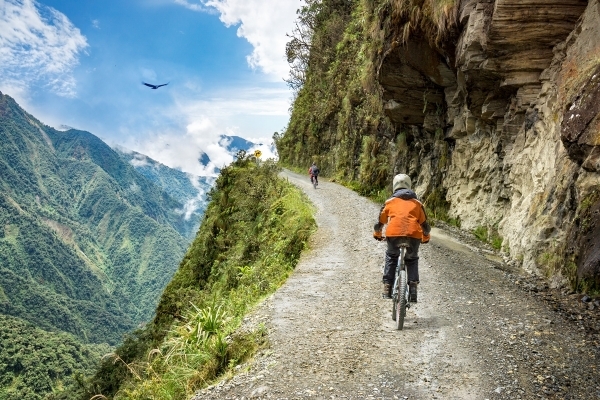 Leave a comment for "Cycling South America: 8 Epic Climbs and Descents" by visiting the original post on our TDA Global Cycling blog.